Buona Pasqua, Felices Pascuas, Frohe Ostern, Joyeuses Pâques - Happy Easter!! Working in Blackfriars, London this afternoon, I was close by to the Scooter Caffe bar, formerly Scooterworks cafe, located on Lower Marsh behind Waterloo station. A classic Vespa would not really be the wedding vehicle of choice, to get you and your new bride to the waiting reception venue, or maybe it would be for a few brave souls..
April 6th saw Retrospective Scooters and The London Scooter Bodyshop hold their annual open day. The weather held out to see a great turnout of some truly beautiful and unique scooters. Organised by The Sunbeam Motor Cycle Club, to take part in the London to Brighton Pioneer Run, you have to have a motorcycle, tricycle, or bike and sidecar that 'left the factory' before 1st Jan 1915. SIP have upgraded the Vespa’s original braking systems with the introduction of two new product lines - the SIP Premium and the SIP Performance brake shoes made from softer, frictional materials. Club members, and intrepid Vespa travellers, Warren & Hayley Jopson, visited Thailand over the festive period; in addition to getting some downtime and warm weather, they were guests at the Northern Scooter Rally. German Vespa friend, Jorg Hemker from Munster, sent me a copy the other day of German namesake's, Vespa Veteranen Club Deutschland, club magazine. Buon Compleanno - Happy Birthday! Yesterday (March 29), seventy three years ago, Piaggio presented their Vespa model, patented April 23 1946, to the market - it seems only fitting to wish the grand lady Happy Birthday! My day off yesterday was spent at Retrospective Scooters; having taken my Motovespa GT160 in for a service, following the winter break. An MOT is no longer required but I would rather be safe than sorry! ‘Amici in Vespa’ translates as Vespa Friends or Friends on a Vespa; which sums it up perfectly! My Italian vespista friend Federico Savogin sent me this lovely old photo of his club back in the day. When it comes to applying stickers on my scooter I'm very particular! At IL CENTRO di Arese, one of Europe's largest shopping malls, comes PrimaverArese with two unmissable events that will take us back through time and let us relive the myth of the Vespa. A couple of new items from SIP Scootershop are these new helmets to mark their 25th anniversary and a handy butterfly, or jubilee, clip for those hard to get places on your scooter. VVC web manager, Alan Springall has been out and about braving a wet Kettering for the Wicksteed Parts Fair and a very blustery London, for the Kickstart rideout from the London Eye to Hoxton. 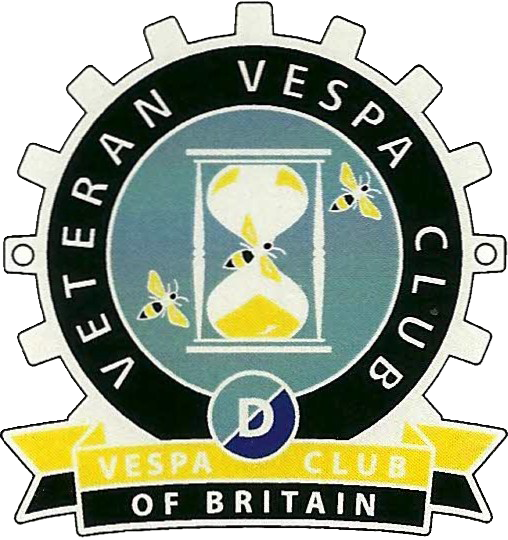 Have you ever wondered how many Vespa models are owned collectively across the club, which model is the most popular, how many members own just one and those where one is just not enough...?? The VVC club shop currently has a surplus of cog badges that have been reduced from the regular price of £20 to £15.